EZ | AR – Cut your DSO up to 50% within 60 days. Break beyond traditional AR processes. Use our ROI Calculator to see how much money you save. Collecting AR should never be so time consuming. Let EZ-AR™ automatically check in with your customer until payment is received. Quickly generate and send an Invoice while utilizing Salesforce's tracking capabilities. Let EZ-AR™ automatically check in with customers and collect Expected Payment Date in addition to their payment. Track how many times your customer has viewed and downloaded the Invoice. Use Reports and Dashboards to track Invoices by status, expected pay date, and more. 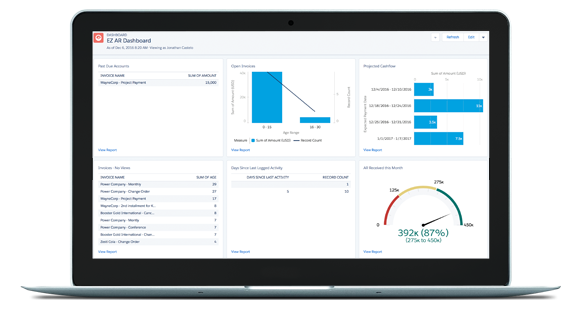 Provide insight with company-wide real time reporting. Consult on the configuration for your software. The integration of EZ-AR™ with Sage Financials is going to revolutionize the invoicing process. No longer will businesses be subject to extended DSO, stunting cash flow. Now, you'll be paid on time and receive real-time analytics for quicker decision-making. With Sage Financials as the marketing and technology leader for Cloud Accounting, along with EZ-AR's easy to use platform; business owners will be back in the driver's seat with consistent cash flow!